As the year comes to a close, let’s take a look back at events that made the headlines this year. In 2017, terrorist attacks and natural disasters wreak havoc around the world. The political landscape also sees deep change, from Zimbabwe to France, with the departure of Robert Mugabe and the arrival of Emmanuel Macron as France’s youngest head of state since Napoleon. Nations around the world are hit by Islamist terrorist attacks, starting with New Year’s Day, when a gunman from Uzbekistan opens fire in a nightclub in Istanbul killing 39 people. The so-called Islamic State claims responsibility. The gunman had trained in Afghanistan according to Turkish authorities. On March 22, a man drives a car into pedestrians on a pavement along Westminster Bridge in London. Four people are killed. The perpetrator, a Briton who had converted to Islam, stabbed a police officer to death before being shot dead by the police. Two months later, a suicide bomber kills 22 people at an Ariana Grande concert at the Arena in Manchester. The dead include ten people aged under 20. Hundreds are injured. In early June, eight people are killed when a van strikes pedestrians on London Bridge. After the van crashed, its three occupants ran to the nearby Borough Market area and began stabbing people in and around restaurants and pubs. Its three occupants are eventually shot dead by police. St Petersburg underground is the target of a suicide bomber on the third of April. Fifteen people die as a result of the attack. A few days later, an Uzbek asylum seeker kills seven people when he rams a lorry into a crowded shopping street in Stockholm. In a similar attack in August, a van rams into crowds on the Ramblas in Barcelona killing 15 people. On the same day, another person is killed in a terrorist attack in the coastal town of Cambrils. Following the same pattern, eight people are killed when a terrorist in a rental truck speeds down a popular cycle lane in lower Manhattan on October 31. Egypt, too, is hit: in April, at least 27 people die in an explosion inside a church in the city of Tanta. Another blast kills at least 16 in front of a church in the coastal city of Alexandria. Both attacks are claimed by the so-called Islamic State. The most deadly attack occurs on November 24, when more than 300 people are killed by gunmen in a mosque during prayer in the city of Bir al-Abed, the main city in northern Sinai. Natural disasters also wreak havoc across the world in 2017. Dozens are killed when category four hurricane Harvey hits Texas on August 25, paralysing the city of Huston with torrential rain and winds exceeding 200 kilometres an hours. Irma, one of the strongest and most enduring hurricanes the Atlantic has ever seen, leaves a trail of deadly devastation, killing more than 130 people, as it tears through the Caribbean, the Gulf and Mexico and the southeastern United States. Hurricane Maria, regarded as the worst natural disaster on record in Dominica and Puerto Rico, causes catastrophic damage and triggers a major humanitarian crisis. US President Donald Trump throws paper towels to crowds during a visit to the US territory. In central Portugal, a series of deadly wildfires erupt across in June, killing at least 65, mostly in the Pedrógão Grande municipality, where a fire sweeps across a road filled with evacuees escaping in their cars. More wildfires in the Iberian Peninsula in October kill dozens more people in Portugal and Spain. In Galicia, fires reach the outskirts of the port city of Vigo, where two women are killed when their car is caught in the flames. In October, a series of wildfires tears through northern California, the deadliest in the Sunshine State’s history. More than 40 people are killed and around 200 are injured. 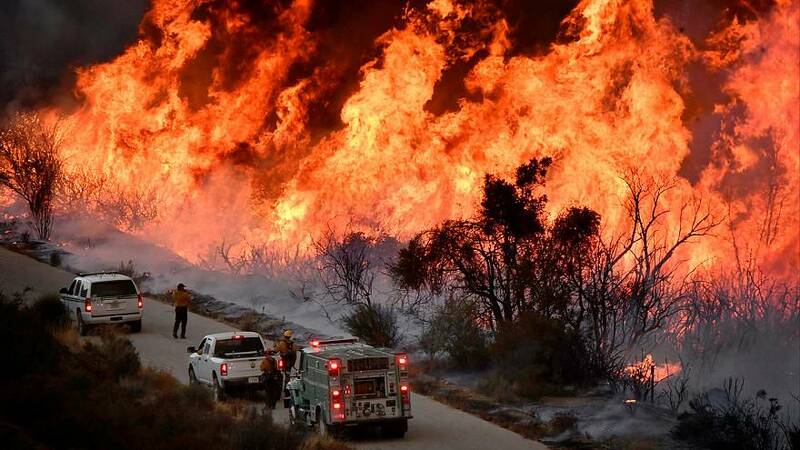 The wildfires are considered the costliest on record. In January, a major avalanche hits a luxury hotel above Rigopiano in central Italy, killing at least 29 people. The avalanche is the deadliest in Italy in a century. Rescue teams manage to dig through the cement ceiling to save survivors. On August 21, the Italian island of Ischia is hit by an earthquake that kills two people. Three brothers are miraculously saved from the rubble. In Mexico, earthquakes strike the states of Oaxaca and Chiapas on the 7th of September killing dozens of people. The Mexican president calls them the “strongest earthquakes recorded in the country in a century”. On September 19, a 7.1 magnitude quake hits the capital Mexico, bringing down dozens of buildings and killing more than 300 people. On November 12, a magnitude 7.3 earthquake strikes the border region between Iraq and Iran, killing more than 500 people. Most of the casualties are in Iran’s western province of Kermanshah. The damage is widespread as most homes are made from mud bricks and not suited to withstand earthquakes. In a landmark ruling, former Bosnian Serb general Ratko Mladic is jailed for life by the International Criminal Tribunal for the former Yugoslavia for war crimes, crimes against humanity, and genocide. As the top military officer with command responsibility, Mladić is deemed by the ICTY to be responsible for the Siege of Sarajevo and the Srebrenica massacre. 2017 is also the year of political change. Zimbabwe’s ruling ZANU-PF removes Robert Mugabe as party leader after 37 years in power. On the November 21, after a week under house arrest, Mugabe sends a letter to parliament saying he resigns as president. His heir and long-serving deputy, Emmerson Mnangagwa, is sworn in as president on November 24 and promises fresh elections. In 2017, France votes for change. On May 7, 39-year old Emmanuel Macron becomes the youngest head of state in France since Napoleon. Macron is elected on a pledge to bring reform both to his country and to the European Union. He first destination is Berlin for talks with Chancellor Angela Merkel on his vision for the future. On September 26 at the Sorbonne, he unveils his plan: more European integration in social affairs, education, taxation and defence. Plans for which he will need Germany’s backing. In the Bundestag elections, Merkel wins a fourth mandate but by a narrow margin and the far-right AfD gets a record 12,5 % of votes. Months of talks to try and form a coalition with the Greens and the Liberals fail – it’s the worst result for the Conservatives in Germany since 1949. In Spain’s biggest post-war crisis, the pro-independence majority in the Catalan parliament votes in favour of a unilateral declaration of independence in early September. The Constitutional Court suspends the referendum law. A referendum ballot is held in Catalonia on October 1. The vote is deemed illegal by authorities and police are sent in to remove polling booths. The crackdown backfires against the government after pictures emerge of violence on the streets. On October 27, the Catalan Parliament votes overwhelmingly in favour of independence from Spain in a secret ballot. Several opposition members walk out. The same day, the Spanish Senate approves article 155 of the constitution invoked by Prime Minister Mariano Rajoy to restore the rule of law in Catalonia and “ensure that elections can be held in normal circumstances”. That same evening, prime minister Mariano Rajoy announces the Catalan Parliament’s dissolution and a regional election for December 21.